Our foundational faith calls us to affirm the inherent dignity in, and live in solidarity with, all women and men. Notre Dame strives to live out this calling by becoming a community that promotes mutual understanding and opportunity for all. Our commitment to diversity and inclusion arises from our aspirations about the community we want to be, the educational environment we hope to provide our students, and the moral character they will develop during their time with us. It goes to the heart of our mission, to who we are and to what we want to be. We affirm the transcendent dignity and worth of every human person, from conception to natural death, regardless of race, nationality or ethnic group, religious tradition, gender, socioeconomic class, immigration status, sexual orientation, or anything else. Human beings are inescapably social, and the flourishing of each individual is possible only in a social context in which we each have responsibilities to others and others have reciprocal responsibilities to us. Together, we strive to realize the common good—that which enables any sort of community and its members to flourish individually and collectively. We are called to live in solidarity with all people, which arises from recognizing that the well- being of each person is a concern for us all. We are all, in one way or another, our sister’s and brother’s keeper. Solidarity demands that we strive to overcome fragmentation and separation to see the deeper unity we share with all people. Sara Bea Disability Services coordinates reasonable accommodations for students with disabilities. These accommodations include modifications to a course, program, or activity that allows a student with a disability to gain equal access. Students may request accommodations each semester. The Gender Relations Center (GRC) designs and implements programs about healthy relationships, gender, and sexuality consistent with the Catholic character of the University. The GRC seeks to engage the campus in respectful dialogue and build a community that fully honors the human dignity of every student. It was the first office of its kind within collegiate student affairs nationwide. MSPS works to ensure historically underrepresented students feel welcome and supported at Notre Dame. They are advocates who provide academic services, cultural enrichment programming, and research grants for all students who would like to explore questions of identity, diversity, and race. The Office of Student Enrichment offers programming and resources for members of the Notre Dame community who identify with the first-generation college and/or low-income student experience, including international, undocumented and DACA, transfer, and other non-traditional background students. By providing the Notre Dame community the opportunity to have a conversation about the unique circumstances many students face, the Office of Student Enrichment helps under-resourced students to flourish under the Dome. The University of Notre Dame does not tolerate sexual and discriminatory harassment of any student, faculty, or staff member of the University community. Together, we strive to create an inclusive and safe environment where all individuals can flourish. 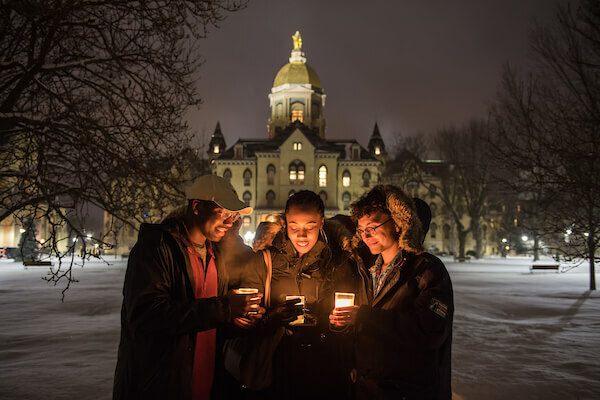 "Let us ask that we can be a better, strong, more respectful, loving community here at Notre Dame," said University president Rev. John I. Jenkins, C.S.C., in a prayer to open the service.